WASHINGTON - The latest edition of The George Washington University Battleground 2008 Poll finds a negative political environment (77% wrong track) with voters most concerned about the economy and jobs (23%), gas and energy prices (15%), and the war in Iraq (15%). The Democratic Party enjoys a lead in both the presidential and congressional generic ballots, leading the Republican Party by 8 points at the presidential level (49%-41%) and 9 points at the congressional level (49%-40%). Large majorities of Americans disapprove of the jobs both congressional Democrats (57%) and Republicans (68%) are doing to confront the issues. "This poll underscores huge difficulties that lie ahead for the Republican Party," said Christopher Arterton, dean of GW's Graduate School of Political Management. "It also shows the continued importance of 'pocketbook' issues among voters. Candidates must show a comprehensive economic agenda if they are to win in November." Voters disapprove similarly of the job performance of President George W. Bush (63%), though a majority approve of him as a person (56%). Forty-eight percent (48%) of voters indicate that the Republicans control the Federal Government, while 30% believe the government is run by the Democrats. A majority (56%) of Americans believe the war in Iraq is not worth fighting. Further, a plurality (35%) of voters believes that the situation has stayed the same in the past six months. Asked what leaders should do with U.S. troops currently deployed in Iraq, 40% of voters support keeping troops there until the country is stabilized, 32% would set a date for withdrawal in the next two years, and 25% believe an immediate withdrawal is necessary. Respondents were asked for their views on military action against Iran if it was discovered that the nation developed nuclear weapons. A plurality (38%) of voters is unsure on this measure, with the rest split between supporting military action (33%) and opposing military action (29%). The negative political environment and widespread disapproval of those in charge of the government carries through into name identifications with majorities of voters holding unfavorable views about George W. Bush (58%) as well as the Republicans in Congress (56%). However, just 46% of voters view the Democrats in Congress unfavorably, with 42% holding favorable opinions. Both Senators John McCain and Barack Obama enjoy majority favorable images (54% for each), and a slight majority of voters views Senator Hillary Clinton negatively (51% unfavorable). Looking at the 2008 presidential election, 53% of voters believe that the race discussion in the Democrats' nominating contest has been a benefit for the country and initiated a thoughtful discussion about race relations. More than a third (35%) indicate that the race discussion has been bad for the country. In trial 2008 ballots, McCain loses by two points to Obama (47% to 49%), but gains a majority of voters against Hillary Clinton (51% to 43%). Further prompted about their vote behavior, 73% of Obama's supporters claim they would support Clinton if she, not Obama, was the nominee, while 18% would not. Similarly, 72% of Clinton's supporters claim they would plan to vote for Obama if Clinton were not the Democrats' nominee, while a fifth (20%) would not vote for him. Examining these results, Republican pollster Brian Tringali said, "The populist themes currently being developed by the McCain campaign recognize the anti-big, anti-establishment sentiment of the electorate and the need for change that the voters of today demand. There is no mistaking John McCain for anything but a Republican, but there is no denying he represents real change." Democratic pollster Celinda Lake noted, "Voters are strongly dissatisfied with the direction of the country and continue to punish President Bush and his Republican Party for the last seven and a half years. Obama is leading McCain in the race for the presidency, Democrats have opened up a double-digit in the generic Congressional ballot, and Democrats own commanding advantages on the issues that matter most to voters right now: jobs and the economy, the war in Iraq, health care, and gas and energy prices." Looking at perceptions of the overall race, a majority of voters (57%) are satisfied with the choice of candidates for president. Pluralities of voters claim that what they have seen, read, or heard about Obama and McCain have made them less likely to vote for those candidates (47% for Obama and 44% for McCain). However, a majority of voters (54%) say that they are less likely to vote for Clinton in light of what they have seen, read, or heard about her. Looking at national economic issues, a majority of voters (56%) believe the current state of the economy is poor, though a plurality believes their personal situation to be excellent or good. Just 14% of likely voters rate their personal economic situation as poor. Twenty-two percent of voters choose gas and fuel costs as the economic issue most likely to impact their presidential vote in November, followed by health care costs (14%) and the budget deficit/national debt (11%). On a series of questions about economic conditions and the future, strong majorities of voters believe it is tough for middle class people to make ends meet (72% agree) while also being optimistic about where their economic situation will be five years from now (67%) and believing that anyone can get ahead with hard work (65%). However, nearly two-thirds (65%) of likely voters believe the next generation will not have a better quality of life. Though on a different question, a plurality (36%) of voters believes their children will be better off in the future. This bipartisan GW-Battleground 2008 Poll surveyed 1,018 registered likely voters nationwide May 11-14, 2008, and yields a margin of error of + 3.1%. First conducted in 1991, this poll has accurately portrayed the political climate through four presidential and three mid-term election cycles. This series of scientific surveys is unique to the industry in that it offers the distinct perspectives of two top pollsters from different sides of the aisle. The George Washington University Graduate School of Political Management is the sponsor of the poll. The university's public affairs, public policy, and international affairs programs (undergraduate and graduate) frequently are ranked highly in leading publications, including recognition as the "Most Politically Active" university in the 2008 Princeton Review. The George Washington University also is one of the nation's best schools in fostering social responsibility and public service, according to the Princeton Review and Washington Monthly, which both included the university among its top-rated schools for community service in recent surveys. Celinda Lake, Brian Tringali, and Ron Faucheux are available for comment. For Lake, please contact Daniel Gotoff at Lake Research Partners, (202) 776-9066. For Tringali, please contact Brian Nienaber at The Tarrance Group, (703) 684-6688. For Arterton, please contact Adela de la Torre at GW, (202) 994-6424. This data also is available via the Internet at www.tarrance.com, www.lspa.com, or http://www.gwu.edu/~newsctr/battleground.cfm. 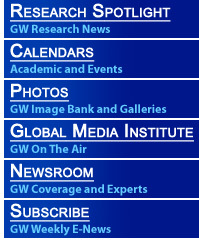 For more news about GW, visit the GW News Center at www.gwnewscenter.org. ©1996-2019 The George Washington University Office of University Relations, Washington, D.C.